Mildred (aka Midge) Burgeson, 91, of Myrtle Beach, SC, loving wife, mother, grandmother and great grandmother passed away on February 2, 2019 after several years of declining health. She was born in Jersey City, NJ, daughter to the late Frederick Joseph and Mildred Marie (Ellenberger) Krais; wife of 69 years to the late Nils G. Burgeson. 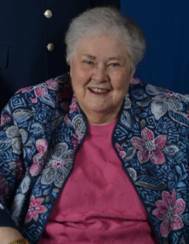 She was a member of St. Luke Evangelical Lutheran Church and enjoyed entertaining, camping, knitting, crocheting, card games and puzzles. Midge is survived by; sons Richard (Carol) and Robert (Tracey); grandchildren Erik, Ryan, Jeffrey (Danielle) and Jason (Kristine); great grandchildren Patrick and Bailey. Interment service will be held at St. Luke Evangelical Lutheran Church, Ocean Isle, NC at a future date. In lieu of flowers, donations may be made to St. Luke Evangelical Lutheran Church, St. Jude Children’s Research Hospital or the American Cancer Society.